This was the perfect wake up call that God gave me even before my morning cup of coffee. I am inconvenienced today, but I am not suffering. I may be frustrated that my plans and designs are being changed by things that are out of my control, but I am NOT suffering. Suffering is taking place all over the world and it is our calling to hear the voices of those who have no power and no ability of their own to make sure their voices are heard and that their sacred worth is honored. There are people who I call sisters and brothers in Jesus who for the very sake of saying Jesus is Lord are suffering at the hands of those who want them silenced. There are also people who suffer at this very moment that face conditions that I as I write these words I cannot begin to comprehend their reality. One of my friends and colleague in ministry works for The Outreach Foundation. Last fall shared with me about the things that he has seen first hand at the UN refugee camps in Lebanon for those escaping Syria. 8 years ago 22 million people lived in Syria. Today 11 million people have left. They really didn’t have a choice. Their homes were taken and there were no jobs, food, water, etc. The people have migrated everywhere. Many live in UN camps in Lebanon or with family in other countries. The conditions are unbelievable. HALF THE POPULATION OF AN ENTIRE COUNTRY! Sorry for the loud font, but ……..
Like I said I cannot begin to process this from my context. What can I or anyone do to help? Get informed. Learn what is really going on and what is not being reported due to the constant news cycle of distraction. If you live near Knox County, IL come hear my friend Mark preach on Sunday, March 3rd at First Presbyterian Church at 9 or 11 AM. 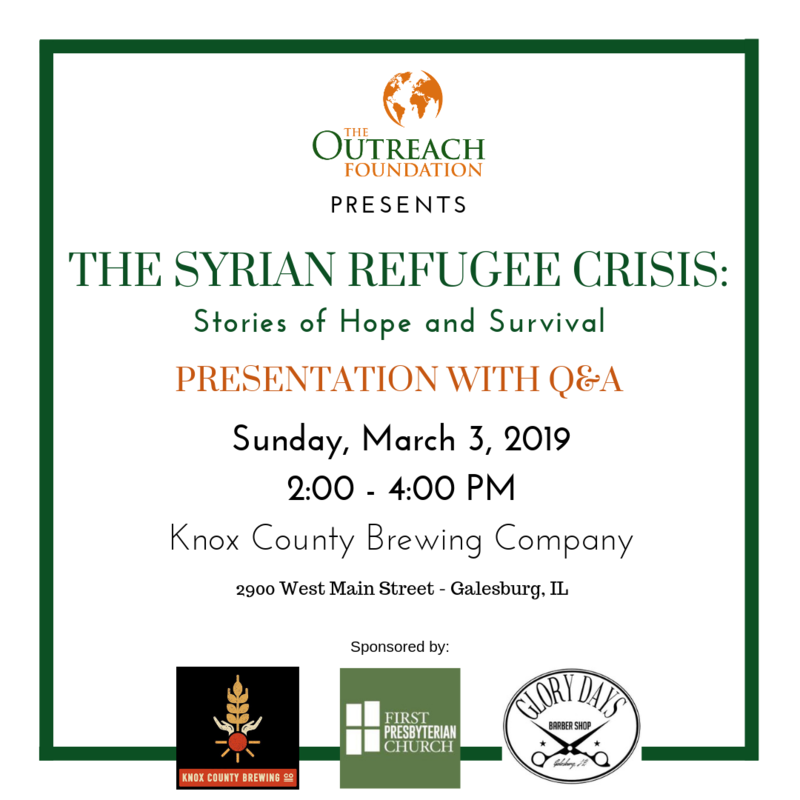 There will also be presentation with Q & A that is free to the public at Knox County Brewing Company that afternoon from 2 – 4PM and beverages will be available for purchase. You can make a contribution to groups like The Outreach Foundation that are using local churches in the Middle East to help provide relief to the refugees. You can pray! That is not the last on the list due to it be the least. It is there as the most important thing. I believe that we can call on God to bring relief to God’s children who are suffering while we work with agencies, governments, religious groups, and non-profits to change people’s lives. Thank you for reading this and at the very most please say a prayer today for the people of South Sudan and Syria.